Shock horror, I can paint. Yes I cheated and used a technique from a book called The Weekend Artist, but I needed something to kick me up the bum and suggest again to myself that I could. 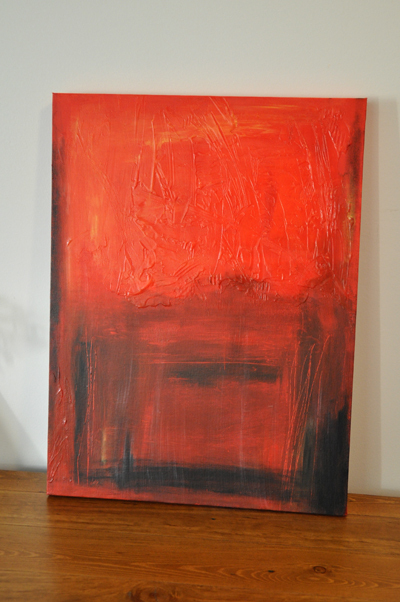 I’ve never really done abstracty stuff before with paint, nor have I ever used gel medium. Infact for a while it looked like there was snot all over the top section of the painting until I bought a little more red paint to the rescue, dont’ think I’ve quite got the hang of using it properly. Gel medium can be used to make acryllics looks a bit more like oils and it took freaking forever to dry in this lovely cold Melbourne – I might as well have used oils. In this photo the varnish on the lower half is still drying. It’s no masterpiece, but it sure was fun!